The future is bright in Christian publishing as new, talented authors are discovered. Each one of the following authors we’ve noted here has at least one book out or soon to be released, reaches out to readers online—through websites, blogs or social media—and points readers to the God they love and serve. From a Lebanese-American emergency room doctor to the son of a famous theologian, from a woman writing for teen girls to a novelist offering gritty biblical tales for men—all offer readers a new perspective on life and writing. Robin Barnett, senior publicist for Revell (Baker Publishing Group), sums up what publishers are looking for in an author they see as a rising star. “We want to get a sense from the author that they have something to say. It doesn’t have to be revolutionary, but they should offer a new slant,” Barnett said. She adds that publishers want authors who are engaged online, pointing to bloggers who already have created an audience who want to hear what they have to say. The standards apply to fiction and nonfiction authors. Booksellers look for the same things in authors whose books they stock—longevity, good storytelling, an eagerness to connect with readers. The list below is a forecast for authors whose books Christian retailers should expect to see on store shelves for years to come. Christian Living, the anchor point for book sales in Christian retail stores, continued to thrive in 2014, strengthened by a renewed focus on content from a new, more diverse group of authors. The category, labeled “Christian Life” by the Book Industry Study Group, includes such topics as relationships, death and bereavement, personal growth, spiritual growth, social issues and women’s issues. Church supplies remain a steady source of sales for brick-and-mortar stores willing to stock up even as some product categories have seen serious shrinkage at Christian retail in recent years. Retailers pursuing church sales of everything from pulpits to pews and from communion wafers to choir robes report that this department not only can hold its own, but also even grow when handled with care. Innovative Inc. has done the research, and results are encouraging. Stores that are successful with church supplies keep in close contact with congregations in their area and ensure that they have plenty of consumables on hand for last-minute Saturday shopping. Tampa Christian Supply has seen such a downturn in sales of Christian books, music and gifts that the store recently announced it will sell only church supplies, a few gifts and Bibles, and the top 10 or 15 best-selling books and DVDs. Jack Savage ran the Christian gifts and bookstore Jack’s Religious Gift Shop in Maryland for 50 years before closing the store in early 2010 when he planned to retire. Instead, Savage found himself in the church-supplies business. Savage keeps the consumables readily available but also stocks a selection of choir robes, chairs, communion tables and clergy shirts for browsing by appointment. One way to get repeat customers in this age of online buying is to carry consumables. Communion cups, seasonal bulletins, offering envelopes and candles get used. When they’re gone, churches need more. They can order them with the click of a button, but shipping often costs extra, and the time it takes to receive what they need can keep a church heading to their local Christian retailer. Today stores may be picking up communion bread that is gluten-free. Swanson Christian Products is one company that offers gluten-free, organic, kosher wafers. Prefilled communion packs like Compak’s Celebration Cup (with grape juice and communion wafer) and Broadman Church Supplies’ Remembrance (with grape juice and communion bread) and Fellowship Cups (grape juice with communion wafer) are seeing sales increases, as churches like the convenience and the ability to easily carry communion off site or take the elements with them on mission trips. Some stores also are seeing a rise in sales of certificates, offering envelopes and bulletins. 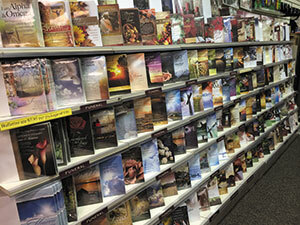 Dightman’s in Washington state has a reputation of carrying the largest variety of bulletins on the West Coast. “We do carry and sell a lot of Warner bulletins,” said Baker, noting she stocks hundreds of designs. Meadows said the ongoing popularity of Warner bulletins remains in part because the company regularly updates the designs of its paper goods, often with the advice of retailers. Beyond the consumables, church furniture is becoming a growth category for some Christian retailers, in large part due to Blue Ridge Church Furniture, the largest American manufacturer of church furniture that does not sell directly to churches, but works only through vendors. Gabrielson said Blue Ridge partners with STL for distribution, and stores can become dealers without carrying bigger pieces in stock. Blue Ridge creates pulpits, chairs, communion tables and baptistries, and also refinishes and reupholsters church furniture. While Savage could stick with showing brochures to his customers, he feels it’s important to have one or two pieces on hand, especially sample chairs. Christmas and Easter call for extra communion supplies and candles for most churches. These holidays present an opportunity for retailers to introduce themselves to church leaders, reminding them that they can buy local. The stores can send out extra discount flyers and coupons to church secretaries during these times of year. 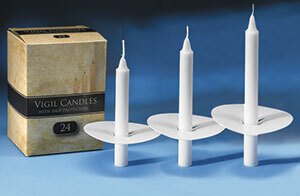 Schroeder said that almost every church uses candles for many reasons during the holidays, from filling candelabras to decorating communion tables to using small tapers during candlelight services. 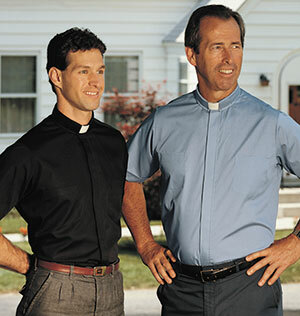 Another item that may be needed for the holidays is new clergy shirts or choir robes. Christian Brands recently acquired R.J. Toomey, billed as “the oldest and best-known” clerical apparel firm in the United States. Savage gives an added bonus to churches that buy shirts and robes from his store. If a church spends $200, he gives them a store-branded robe bag. The bags cost Savage less than $3 each, and the choir then carries Savage’s store name wherever they travel. If stores want to buy the bags separately, he sells them for $7.95. Retailers reported mixed results selling curriculum to churches, with increases in small-group studies for adults and decreases in children’s and VBS overall. Case Bibles do well, as well as DVD-driven products for small group studies, Baker said. Savage has seen Sunday school curriculum sales drop. Christian retailers hear it all the time, but in church supplies—as with most categories—nothing brings in sales better than by building relationships. In order to reach churches new and old, that may mean pounding the pavement, visiting churches face to face to introduce the store and what it has to offer. Smaller stores can work the phones when there is a lull in traffic. Hosting an annual pastors’ breakfast can break the ice, and inviting secretaries and board members may broaden retailers’ ability to reach decision makers. Retailers can always make sure they are getting to know every customer who walks into the store. Another way stores are reaching congregations is through joining marketing groups and programs to take advantage of discounts as well as catalog and coupon promotions. Innovative’s Church Marketing Solutions offers a comprehensive program with an annual church supplies catalog and three seasonal catalogs. The catalogs are custom-branded with the store’s information. “We work with about 50 different vendors and work very hard to build and grow our church business within the retail industry, not only with our catalogs, but through our more than 200 Signature store websites,” Hurst said. Munce Group offers a new 16-page church supplies catalog, featuring eight pages of standard items and eight pages of small group, Sunday school/children’s ministry and pastoral items. 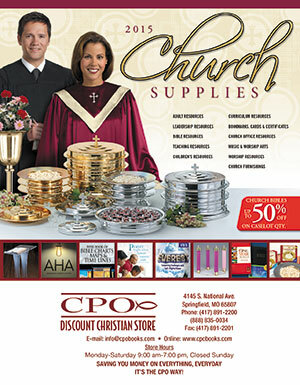 Covenant Group and Christian Brands each offer an annual church supplies catalog. Covenant publishes a 400-page catalog for the category each September that goes out to more than 60,000 churches. Covenant provides its member stores and Parable franchise stores with the catalog. Christian Brands produces a 135-page spring church supplies catalog that is not branded, so that stores can put their own sticker or stamp on it. Another way for stores to participate in deeper discounts and promotional materials is through STL’s Premier Partner Advantage Program. Stores that join the program receive an extra discount on more than 200 church supply items in 16 categories from vendors such as B&H Publishing Group, Abingdon Press and Swanson. In addition, Premier Partner Advantage participants will receive specials on certain seasonal and best-selling products. They also will receive downloadable marketing materials like videos and brochures. Some Christian retailers are going to new churches as well as visiting current customers, reminding them of all the ways their store can benefit congregations. Barber also encourages building relationships with churches. “In our Premier program, I plan to give retailers tools that almost force them to get in front of church pastors and church secretaries and decision makers—those that are making buying decisions for local churches,” he said. Retailers also can build relationships by promoting the “Shop Local” theme and partnering with other businesses such as audiovisual equipment dealers that work on church sound systems or dry cleaners that handle choir robes. Offer to cross-promote each other’s businesses with flyers and coupons. Derreberry reminds his fellow retailers of how important it is to simply get the ball rolling in the right direction. Christian Retailing was privileged to chat with B&H Publishing Group’s Selma Wilson earlier this year. Wilson took the helm of B&H in 2010 and oversees the company’s products, which include the Holman Christian Standard Bible; B&H Books—fiction, nonfiction and children’s; B&H Academic; Broadman Supplies; and Crossbooks’ self publishing. A former social sciences teacher, she is married to a marriage and family minister. Devotional books didn’t often make headlines, that is, until Sarah Young came along with her 10-million-copy-selling “Jesus Calling” brand from Thomas Nelson. Ann Voskamp of One Thousand Gifts fame also has had success with a devotional based on her best-selling Zondervan book that helped readers cultivate thanksgiving and joy—and this year Tyndale will release her Christmas devotional, Unwrapping the Greatest Gift. Whether headline-making or not, readers of devotionals often want new titles for themselves and to share with others. Talk to Christian retailers, publishers, editors, agents and authors, and they all say the same thing about the state of Christian fiction: Like a good suspense novel, the plot keeps changing. This fall brings the release of the Modern English Version (MEV) Bible—the first update of the original Bible texts in the King James tradition in over 32 years. Passio, an imprint of Charisma House, will release several offerings in the September launch of this significant work. As a book retailer, you’re familiar with traditional CBA publishers like Thomas Nelson, Howard Books, Harvest House Publishers, Zondervan and Bethany House. You typically know what to expect from these well-known publishers. You know the genres in which they specialize, you understand the audiences they’re reaching, and you’re familiar with the doctrine governing the pages of the books they publish. The 2014 International Christian Retail Show (ICRS) is nearly underway in Atlanta, and the theme—Cause to Celebrate—highlights the good things going on at the show and in the Christian retailing industry as a whole. Online shopping may be one popular way to buy today, but a recent study shows that in-store experiences are still more valuable to customers—if the store makes them feel like they are getting a customized shopping experience. Consulting firm A.T. Kearney recently studied the shopping patterns of more than 3,000 U.S. and U.K. consumers and found they spent 61% of their shopping time in stores. Even better news for brick-and-mortar stores: 40% of the in-store shoppers spent more than they had originally planned, while only 25% spent more than expected when they shopped online. Customers today have limited time and budgets, so what compels them to drive to their local Christian retail store instead of ordering online? A personalized, positive experience. Today’s consumers head to the store for the instant gratification of taking an item home, but also to experience products and to socialize with friends and family. They want to shop in welcoming, inviting retail spaces that engage their senses. That’s why it is critical for retailers to take a good hard look at their stores and see if it’s time for a makeover. With reality television shows, websites and hundreds of thousands of Do-It-Yourself (DIY) projects on the Internet offering step-by-step advice on everything from complete makeovers to the most detailed displays, design experts say there is no excuse for any store to look dirty or dated. Phibbs says the advantages of emptying the store completely are many, including the chance to see old things in a new light, the opportunity to find things you didn’t even know you had and a way to give a fresh look to the store because it sparkles again. Stores should be painted at least once every three years, Fielitz suggests, because of dings, chipping and fading by sunshine and fluorescent lighting. When you paint, stick with the basics on your biggest walls, like an off-white with a little bit of gold in it, a slight brown-beige or a true beige. Super neutrals include true navy blue, vivid red, chocolate brown and deep gray, like the colors Ralph Lauren is known for, Fielitz noted. Another key to freshening up your store is to make sure the light fixtures are appealing to the eye. Lights should be clean and bright enough to illuminate, but not glaring. Get to know the pros and cons of different kinds of light bulbs—fluorescent, incandescent, halogen and CFL (compact florescent light bulb). Light fixtures can easily be created by painting old lamps or lampshades to give them a new look, hanging several shades together (like a mobile) or even making a light fixture from crib springs hung with mason jars or wrapped in Christmas lights. Once your store sparkles, it’s time to put it back together. If you can’t empty the store, you still need to move fixtures, displays and products often to give customers something new to focus on every time they visit. Phibbs notes that directing traffic flow with design is important. In North America, people walk into a store and turn right, then walk counter-clockwise. Keep crowding down by creating lots of open spaces and aisles. Break up your bookshelves into smaller sections. Four-foot sections are ideal, with focal points of color in the middle. Rustic and vintage looks are extremely popular, and experts predict the trend will stay due to tighter economic times, a concern for the environment, the popularity of DIY and the nostalgia factor. That makes it easy for retailers to create new displays without a lot of cost or time by simply using things they already have or buying inexpensive items at garage sales, flea markets and thrift stores. One example is turning wood pallets into walls, stacked displays and backdrops. They also can be cut to make shelves, tables and benches. Fielitz said Goodwill stores and Habitat for Humanity’s ReStores can be treasure troves for retailers wanting a new look. Old plywood, lumber, windows, doors, dressers and drawers can be converted into shelves, tables, signs, room dividers and jewelry display cases. Buckets, wooden boxes and crates of different heights add depth and interest to tabletop displays. Ribbon, greenery and floral arrangements also can add warmth and color. “A lot of stores still have the glass with brass or chrome shelving units and display cases and those just look outdated,” Fielitz said. “Sell them on Craigslist and use the money to buy some antique night tables, end tables, cabinets or fireplaces. With things like that, you can spray-paint them and do just about anything. “A lot of my display pieces are antiques or garage sale pieces,” Schneidt-Hill said. “Right now I have two really rough sawhorses. I took an old door and put wooden boxes on top and greenery around it, then added cross vases and picture frames. It didn’t cost me anything. The old door was in my garage. Schneidt-Hill says even if a retailer is extremely design-challenged and feels like he or she doesn’t have any artistic talent, simply try something new. Geist agrees that even little changes can make a big difference. A splash of color often helps sell product. Wrapping paper, tissue paper and fabric are great ways to add color that is cheap and temporary. Gift wrap can be wrapped around flatwall, put in picture frames, torn into confetti and taped around endcaps. Tissue paper can be transformed into flowers on the wall, stuffing for gift bags, padding inside boxes and used in many other ways. “I just spent time in Branson (Missouri) and walked a row of gift stores, and I went into one where everything was just kind of stuck out there,” Morris said. “Then I went into a really beautifully arranged store, and the difference was amazing. While it’s easy to get ideas and step-by-step instructions, especially with the advent of Pinterest.com, it can be more difficult to create your brand. Your design should tell your story, with the emphasis on the categories that are your specialty. Customers should be able to see and hear your story, to experience your mission and ministry through signage, products with a message and personal touches. Slaughter said Christian stores who see their story as their brand and develop their strengths and specialties can offer a more customized experience to their shoppers. Slaughter said customers are attracted to messages of hope and grace, and Christian stores give that hope when they share their story through inviting displays. “Stories unite people, stories create multiple sales, stories create loyalty,” he said. Retailers should know their community’s story too. Giving a store a design overhaul can be work and fun, retailers agree. And it is crucial for any store wanting to stay competitive today. Lewis said if you can’t do it yourself, enlist help. She gets assistance from a designer she met at church. Other stores use community college fashion and design students who want to add new displays to their portfolios.